Hello again to all my friends here at The 36th Avenue! 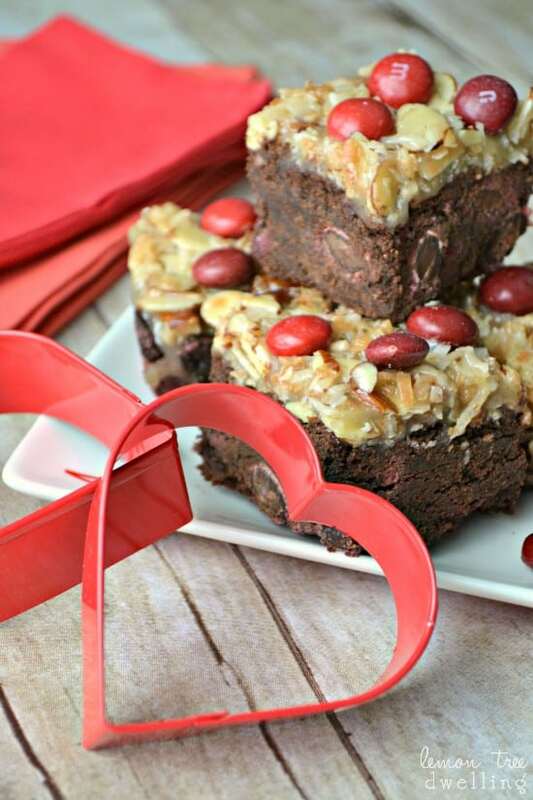 I am so happy to be back today…just a week before Valentine’s Day…sharing this delicious German Chocolate Cherry Bar Recipe with you! Do you look forward to Valentine’s Day as much as I do? I don’t know what it is – maybe the fact that I have 3 girls and Valentine’s Day is such a fun, girly holiday – but we have been celebrating it for weeks now! Our kitchen table has been full of paper hearts and sequins and glitter and glue since January 2….so needless to say, we’re ready for it!! We have one last hurrah planned for this weekend – a Valentine’s Day party! Both of my older girls invited two friends over for a day of crafting, baking, and Valentine’s Day fun, and they could not be more excited. I’m excited, too….I can’t wait to see how the day goes and I can’t wait to do some crafting and baking with the kiddos and their friends! I’m not sure yet what we’ll decide to make – we have definitely sampled MORE than our fair share of Valentine’s Day treats in the past few weeks! 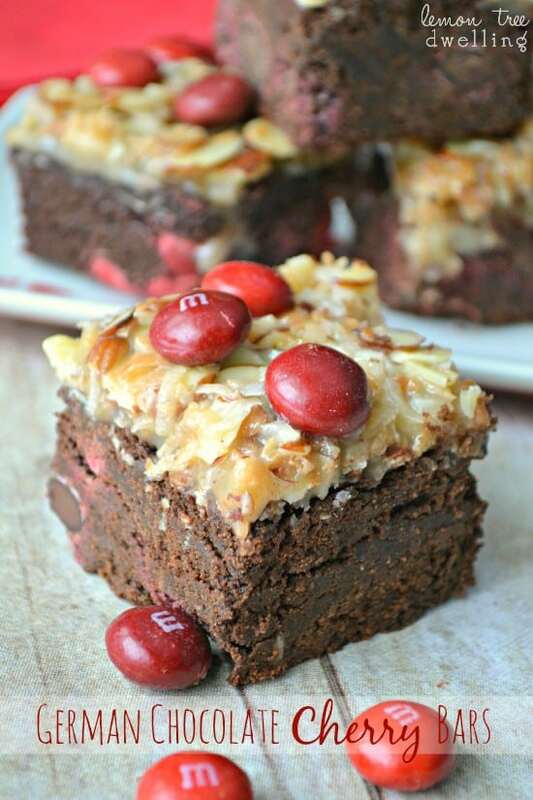 We’ve made Chocolate Cherry Cordial Fudge, Strawberry Cheesecake Monkey Bread, Chocolate Covered Cherry Muddy Buddies, Peanut Butter Chocolate Fondue, and, of course, these German Chocolate Cherry Bars! All of them were hits, but there was something about these bars that was especially….well….special! They are thick, rich, and cake-like, with hints of almond and cherry and a sweet, gooey coconut topping. I’m secretly hoping the girls will choose these….but at the end of the day, I’m leaving it up to them. After all, the entire day is FOR them! I just love the fact that they love celebrating Valentine’s Day with me! What about you? Do you have any fun Valentine’s Day plans?? In small saucepan combine chocolate, butter and sugar over low heat; stir constantly until chocolate is melted. In large bowl beat eggs, oil, and vanilla; stir in chocolate mixture. 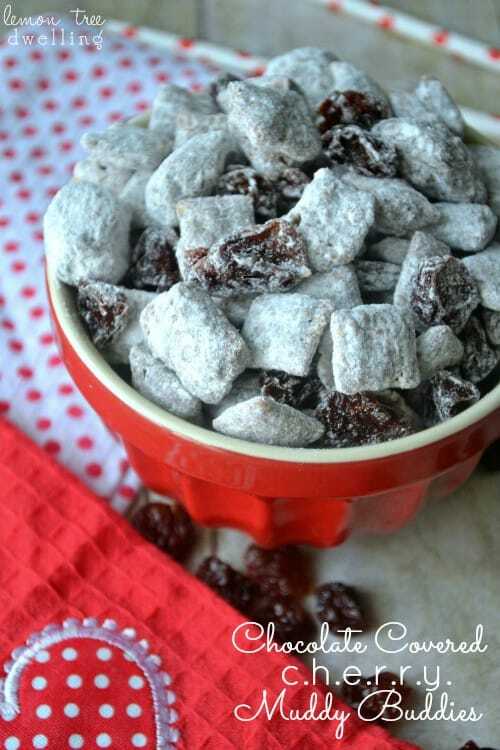 In a separate bowl combine flour, cocoa powder, baking powder and salt; add to chocolate mixture and stir in 1 c. M&M's. Spread batter in greased 8x8 inch pan. 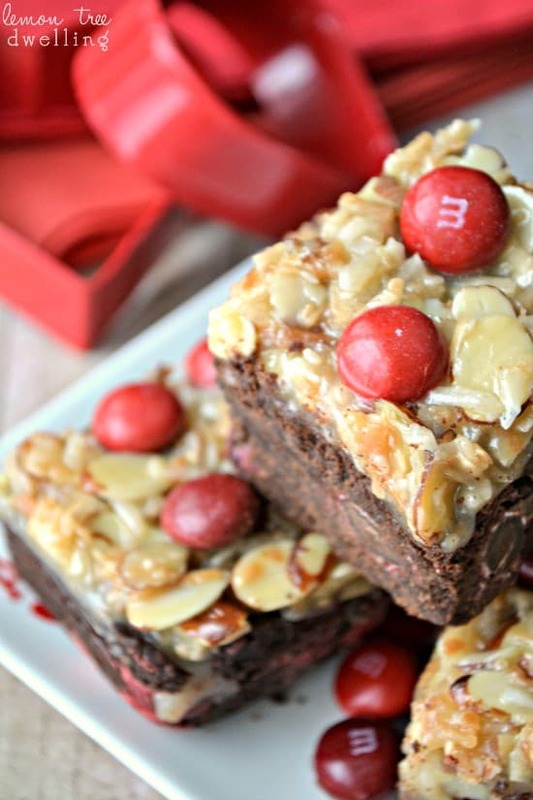 Cool completely; top with coconut topping and additional M&M's. In large saucepan melt butter over medium heat; add brown sugar and corn syrup and stir until thick and bubbly. Remove from heat; stir in remaining ingredients. Spread evenly over cooled bars. Thanks so much to Desiree and to all of you for having me here today! 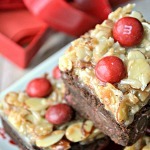 I’d love for you to stop by and check out some of my other delicious Chocolate Cherry recipes! 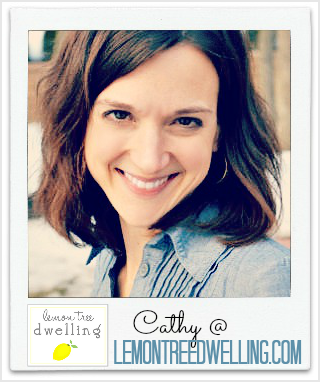 Cathy, these look wonderful! Especially the topping! These recipes look wonderful! I just made a chocolate covered cherry cookie recipe yesterday. Adding these to my recipe file. Thanks for sharing! Thank you, Dawn! 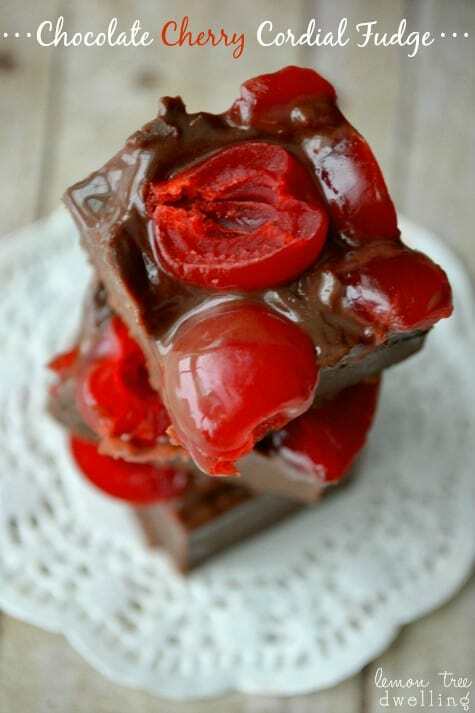 Your chocolate covered cherry cookies sound delicious too!! 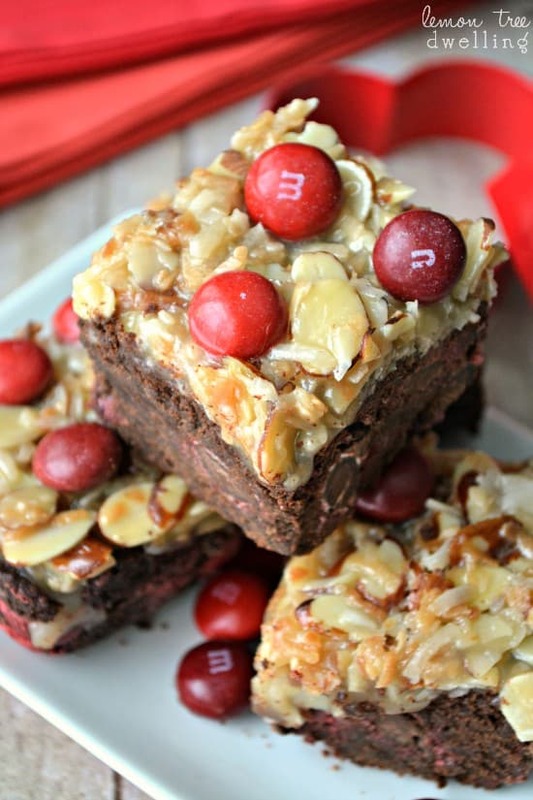 Oh these look so tasty, especially that topping! Thanks, Heather! The topping definitely makes the bars!! 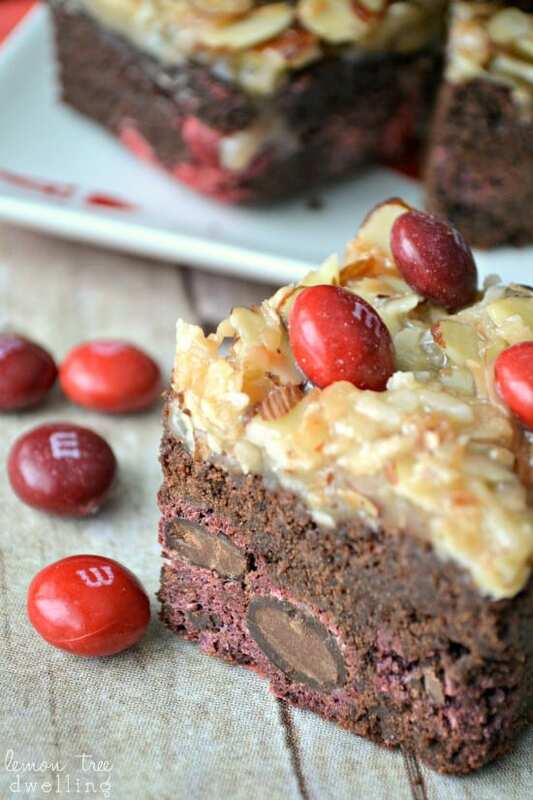 Wowww These look amazingly delicious!! Thanks, Gina! They’re definitely loaded with goodness…!